Boy, Do I Hate Them Birds! Durn blast, I detest me them birds! 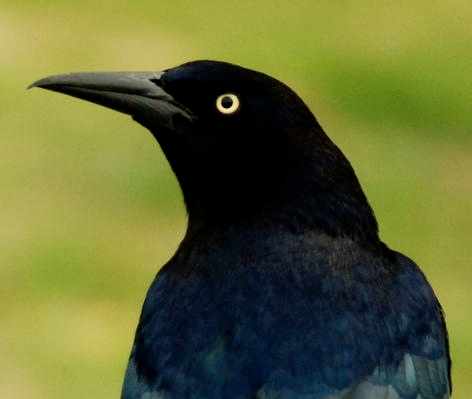 They’s called Great Tailed Grackles. Come up from Texas and them parts. An ugly enough moniker, but it don’t tell the whole story. Attacked Mama’s big yeller cat. Two of em’ at once, a’while the rest of the herd kept watch from the fence over yonder. Filthy vultures spooked Blondie so bad she hid under the front porch fer three days, couldn’t even coax her out with chicken leavin’s. Pecked the dickens outta the roof di-rectly over my bed. Thought they was comin’ plumb through! Found sawdust on my pillow next mornin’. Sounded like one o’ them jackhammers down to the quarry. Rhythmic, but destructive-like and dishonorable somehow, bodin’ of evil and wrongdoin’. Dive bomb our ragtag baseball team down to the school regular. Takes ’bout an inning, maybe two, but after that we get cocky and seems the attack is even more fretful. Race us to the ground balls, peck the straw fillin’ from second base, all the while we’re a’shooin’ and a’shoutin’. Big ol’ ugly things ain’t even worth eatin’. Oily. Taste like last week’s road kill. Figured to a’scare them suckers off, I got me a couple with Grandpap’s ol’ 22. Mama wouldn’t let me bring ’em in her kitchen. Shooed me out, fussin’ and a’wavin’ her apron. Purty near got myself a whoopin’ my ownself. Enterprisin’, ‘er so some say, I popped ’em in a burlap sack, hightailed it down to the crick, skinned them nasty things, then cooked ’em over a fire right down to the water’s edge. Smoke stunk. My clothes stunk. My personal self stunk. Everthing within smellin’ distance stunk something awful. Ain’t no quitter, though, no matter how you peel it, so I took and peeled me off a gray piece o’ smokin’ meat and took me a taste. Gagged fer ten minutes, even after a’drinkin’ a good part of the crick and a’dunkin’ my whole top half in the same. I can still taste that mean things, just ‘memberin’ gives me the shivers. Slimy and vile, tasted that sucker with ever breath I took, and I tell you what, I reckon I’ll never try that agin. I’d swear to that, if’n the Lord God didn’t forbid it. ‘ Course, truth be told, these is “devil birds” and nothing the Good Lord woulda created purposeful. The Almighty might appreciate a curse word or a couple tossed their way. But now as I’m rethinkin’ it, I just may let some other feller go to doin’ the cussin’. I sure don’t want to wreck my chances for the everafter and them streets o’ gold. Look a’ here, there’s a couple a flyin’ over right now. I’ll admit to duckin’. My fear is justified and natural and I ain’t ashamed. They’s disgustin’ and bent on ill. The more we shoo ’em away, the more o’ them danged things flock to the rescue. Them beady black eyes challenge us all to just go ahead and do somethin’ about it. Why, Daddy and Grandpap tried ticklin’ and tuckin’ aluminum foil to the tree branches and ’round the barbed war. Heck if them grackles didn’t eat it up, then reguritate it right back on Mama’s back porch. Putrid piles of hair and half di-gested animal parts didn’t look no purtier with flecks of tin foil sparklin’ amongst the dross and ooze. Mama wouldn’t even take a step out until we kids scrubbed and cleaned. Weren’t no piece o’pie, I tell you, a’cleanin’ and holdin’ our co-llective noses at the same time. And where Dad and Grandpap lit off to so as to miss the fun, I still do not know. I do know they was smarter’n me. So now, I s’pose we just got to live with these creatures. No pleasant neighborly-like livin, I’ll tell you that. Ain’t even possible, nor desirable. I hear tell they work themselves clear across the country, findin’ the fresh and new and innocent of God’s precious creation on which to deposit their gore and disdain. So I mean to wait them out. They’ll move along by and by, and I aim to be here after they move on down the line. I will continue to shake a fist or two their di-rection, and duck if they meet my eye. Now, this ain’t givin’ up. I just know when to lie low and let the dark storm pass on by. This’d make a real good movie down to the picture show. Chat • Posted on January 15, 2014 by Belles and Whistles	• This entry was posted in Uncategorized and tagged Grandpap, Great Tailed Grackles, Mama. Bookmark the permalink.